No fight team had more on the line at UFC 156 than the talented Blackzilians. 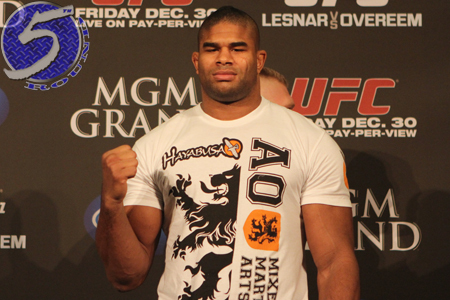 The squad’s top two superstars were on display: Alistair Overeem (Pictured) returned from a nine-month testosterone suspension would have earned a shot at Cain Velasquez’s heavyweight crown with a win over Antonio “Bigfoot” Silva, while Rashad Evans could have found himself in a tango with middleweight king Anderson Silva had he defeated Antonio Rogerio Nogueira in the show’s co-featured attraction. Unfortunately for the Boca Raton teammates, they both found themselves leaving Las Vegas in disappointment. Overeem was winning his fight until Bigfoot turned up the heat in the third round. Before anyone realized the rally they were witnessing, “The Demolition Man” was unconscious on the canvas. Evans, a 5-to-1 odds-on favorite, didn’t fare any better in his unanimous decision defeat to Little Nog. Neither of the MMA icons impressed UFC president Dana White, and of course, the boss didn’t bite his tongue afterwards. “Blackzilians didn’t represent [at UFC 156],” White stated following Saturday’s press conference. “It was a bad night for them. In the first round, [Overeem] was running into a clinch. He wasn’t throwing anything. Running into a clinch, his hands were down by his knees. Yeah, it was a weird fight. During his rant, White delved further into the Blackzilian roster and discovered another one of their studs was far from spectacular in his last outing, as well. However, White did spotlight Vitor Belfort as the only member from the star-studded crew to live up to expectations of late. UFC light heavyweight champ Jon Jones also noticed the team wasn’t up to par this weekend. “Interesting night for the Blackzilians,” Jones tweeted following Evans’ loss. Former head coach Mike Van Arsdale reportedly left the Blackzilians last August so he could be closer to his family in Arizona. Mario Sperry is now the team’s new ringleader. His assistant is MMA veteran Jorge Santiago.